You may have heard this term, but many of you do not know it properly. Let us start studying this topic. Domain name is an identification string that defines a realm of administrative autonomy, authority, or control on the Internet. In simple words, it is the name of the website. It is difficult for a user to memorize the numeric values (IP) for accessing a website like 174.12.14.10 so we give it an English name which is easy to memorize like catchupdates.com or google.com. Here both catchupdates.com and google.com are domain names. In general, a domain name represents an Internet Protocol (IP) resource, such as a personal computer used to access the Internet, a server computer hosting a website, or the web site itself or any other service communicated via the Internet. Domain names are formed by the rules and procedures of the Domain Name System (DNS). Domain names are used in various networking contexts and application-specific naming and addressing purposes. Domain name space plays a vital role in defining the domain name. Tell me, how many google.com and facebook.com are there? Obviously one. Have you thought that why it is so? Why can we not create a domain name which is existing? The reason for this is that the domain names are registered by an organization names as Internet Corporation for Assigned Names and Numbers (ICANN). ICANN manages the top-level development and architecture of the Internet domain name space. It authorizes domain name registrars, through which domain names may be registered and reassigned. The domain name space consists of a tree of domain names. Each node in the tree holds information associated with the domain name. The tree sub-divides into zones beginning at the DNS root zone. 2. Geographical domains: These type of domain indicates the code for individual countries. You might have been now familiar with the top level domains. A top-level domain is also called a TLD. 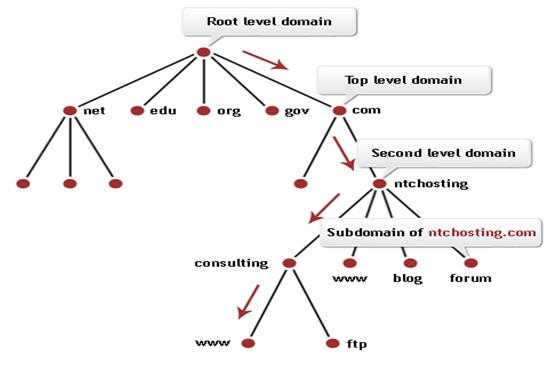 Top-level domains form the DNS root zone of the hierarchical Domain Name System. Every domain name ends in a top-level or first-level domain label. Below the top-level domains in the domain name hierarchy are the second-level domain (SLD) names. You can find this on the left of TLD. As an example, in the domain example.co.uk, co is the second-level domain. The right-most label conveys the top-level domain; for example, the domain name www.catchupdates.com belongs to the top-level domain com. The hierarchy of domains descends from the right to the left label in the name; each label to the left specifies a subdivision or subdomain of the domain to the right. For example the label example specifies a node catchupdates.com as a subdomain of the com domain, and www is a label to create www.catchupdates.com, a subdomain of catchupdates.com. This tree of labels may consist of 127 levels. Each label may contain from 1 to 63 octets. The empty label is reserved for the root node. The full domain name may not exceed a total length of 253 characters. In practice, some domain registries may have shorter limits. A DNS server is just a computer running DNS software. DNS server is made up of mainly two elements- resolver and actual name server. Every time a domain name is typed in a browser it is automatically passed on to a DNS server, which translates the name into its corresponding IP address (e.g. the domain name catchupdates.com is translated to ). As we mentioned that we do not need to type the IP directly in the browser. We only type the English name or simply domain name to access a website. When we type in a URL, browser sends a request to the closest name server. If that server has responded a request for that same host name, it will locate the information in its cache and will reply. If the server is unfamiliar to host name, the resolver will attempt to solve the problem by asking a server farther up the tree. If that too does not work, the second server will ask yet another- until it find one that knows. Once the information is located, it is passed back to your browser and you can do your work.. In this way, we become able to access the websites in an easier and efficient way.